Gaarde Christian School recognizes that parents and students are primarily responsible for the appearance and dress of the student, therefore guidelines have been limited. The purpose of the guidelines established is to best enhance the learning environment and uphold the spiritual climate of Gaarde Christian School. The goal is to create an environment that discourages using fashion as a status symbol or arena for competition. Acceptability of dress should not determine the acceptability of the student. Each individual should be recognized for his/her effort, abilities and spirit. The school also endeavors to encourage Christian young people to be concerned with the Biblical principle of modesty. Daily attire shall be neat, clean, pressed and in good condition, no holes or worn through areas. Clothing will be of proper fit – not tight or baggy. Pants will sit on the waistline. Khaki shorts may be worn. All shorts/skirts/dresses/jumpers must fall within 3 inches of the knee. Shoes must be worn at all times. We discourage open-toed and high heel shoes due to safety issues. Specifically excluded are: hats, flip flops, sweatshirts, sweatpants and unnatural hair coloring. Hooded sweatshirts (pullover or zip up) and coats may not be worn in the classroom; they may be worn during recess. 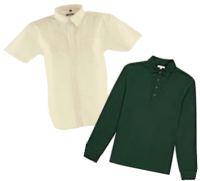 Gaarde shirts may be worn on Fridays and are required for all field trips. Top Colors: Dark Blue, Dark Green, Yellow, Gray, White. Pants/Shorts Colors: Black, Gray, Dark/Navy Blue, Beige. Shirt Styles: Polo, button down. No t-shirts except on Fridays. 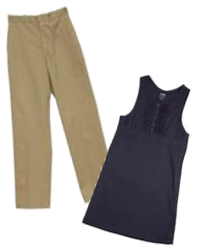 Pants/Shorts/Skirts/Jumper Colors: Black, Gray, Dark/Navy Blue, Beige. *Leggings (in colors listed above) only if worn under skirts or jumpers. Shirt Styles: Polo, button down, scoop neck. No t-shirts except on Fridays. Students may wear jeans and t-shirts that are proper fitting and in good repair. Clothing or jewelry with emblems, writing or pictures shall reflect that which is wholesome and positive. Any clothing or jewelry that depicts values contrary to that of the school’s mission or principles is not allowed. Student’s hair should be clean, neatly groomed and not interfere with eyesight. No “distracting” styles or unnatural colors. Jewelry for girls should not be excessive or distracting. Earrings are to be worn in the earlobes only. For boys, no earrings are allowed at school. Specifically excluded are visible tattoos as well as adornment with compromising symbolism and body jewelry. Middle School girls may wear light make-up. Enforcement of the dress code will be in accordance with the spirit of the rules as well as the wording. If in doubt as to the acceptability of an article of clothing, ask the administration ahead of time. The administration reserves the right to judge any article of clothing on an individual basis for appropriateness, neatness, and modesty. 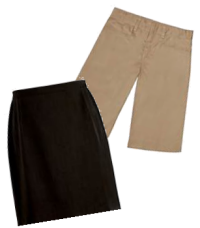 While it is possible a student’s attire or hairstyle meets the letter of the Dress Code as stated, these may not be appropriate as worn, particularly while sitting or walking. If attire is not appropriate, the student will be sent to the office and will remain there until acceptable clothing is available.